IS WRITING A LETTER OF RECOMMENDATION A PROFESSIONAL RESPONSIBILITY OR A POLITICAL CHOICE? 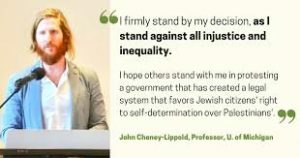 Abby Ingber, student refused recommendation by Prof. Cheney-Lippold (JTA photo). This alarming claim would create a new faculty “right” in which individual political belief can override university policies and professional standards. If this principle were actually applied, great harm would result. Imagine Democratic law professors refusing to write recommendations for a worthy student eager for an internship with a conservative Republican judge. Further, the online statement gives another reason to support Cheney-Lippold: “Some students, specifically students of Palestinian, Middle Eastern, and Muslim background, who attempt to travel to Israel and the Palestinian territories may be denied visas to Israel or would be denied entry into the country.” No evidence of such travel restrictions is presented, but the politicization of professional responsibilities raises real concerns in any case. Would professors then be within their rights to refuse a Muslim student wanting to study in Qatar or Saudi Arabia because it would be difficult for Jewish students to travel there? Could they refuse a recommendation for any student wanting to study in the United States, because of President Trump’s anti-Muslim travel ban? 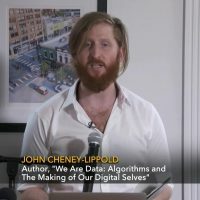 BDS-affiliated faculty have also organized an online petition supporting Cheney-Lippold, offering pledge for faculty, administrators, students, and staff to refuse to participate in study abroad programs in Israel. Although this pledge does not state explicitly that faculty should refuse to write letters of recommendation, by urging signers to endorse USACBI’s boycott call and discouraging any form of participation in a study abroad program, it implicitly does so. For boycott endorsers, opposition to Israel has a moral status that outweighs academic freedom and even a student’s right to learn. Cheney-Lippold’s action acquired an additional complication after he told the Detroit News he had in fact previously written letters for two students applying to study in Israel. “I wrote for them because I did not have tenure,” said Cheney-Lippold. “I know how people are treated without tenure.” Although this may put the unqualified character of his political commitment in question, its more serious implication is that tenure in effect may protect a faculty member’s ability to substitute political for professional criteria in fulfilling academic responsibilities. Professional ethics and AAUP policy specifically oppose politically based actions. The AAUP’s “Joint Statement on Rights and Freedoms of Students” states: “The professor in the classroom and in conference should encourage free discussion, inquiry, and expression. Student performance should be evaluated solely on an academic basis, not on opinions or conduct in matters unrelated to academic standards.” While not specifically referring to letter-of-recommendation policies, the AAUP clearly objects to the curtailment of student free expression, political opinion, and academic choice, which would include efforts to block study in Israel. It is important that the University of Michigan faculty senate has unanimously stated that student qualifications, not faculty political views, should determine whether one agrees to write a letter of recommendation. That effectively isolates those who politicize their professional responsibilities in this way. It will discourage some faculty from following Cheney-Lippold’s lead who might otherwise be inclined to do so. But it is unlikely to have much impact on the most strongly committed boycott activists. So we regret that the Michigan Senate did not support some form of sanction. Not writing a letter of recommendation for political reasons is not a firing offense, but it might, for example, delay or eliminate a scheduled salary increase. ← Is ‘Open Hillel’ Closing Hillel?